The Canadian Association for the Study of the Liver has updated their hepatitis C management guidelines. Click below to view. VOSEVI™ (sofosbuvir, velpatasvir/voxilaprevir) is now available on BC, Ontario and Quebec drug plans (formularies). The treatment involves taking one pill (with food) per day for 12 weeks. Today it was announced that all residents of British Columbia are now eligible for chronic hepatitis C treatment. For more details, see the BC Ministry of Health News Release. The Ontario ministry of health expanded hepatitis C treatment to all people living with hepatitis C.
For more details, see the CBC News report. Pan-genotypic drugs MAVIRET (AbbVie) and VOSEVI (Gilead) have been approved for hepatitis C treatment in Canada. For more information, see: AbbVie's press release. There is much excitement about the new, highly curative treatments for HCV that can reduce illness and death associated with this virus. However, the potential impact of these new drugs will be blunted if people affected by HCV are not encouraged to move along the HCV Cascade of Care. WORLD HEP DAY: Knowledge generation to save lives from Hepatitis C! Knowledge generation to save lives from Hepatitis C! 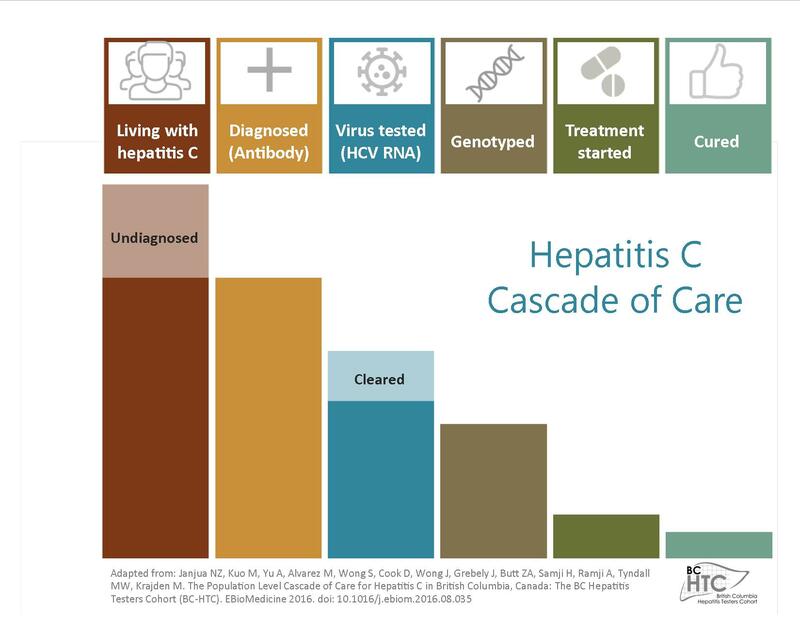 The British Columbia Hepatitis Testers Cohort (BC-HTC) is one of the most comprehensive population based cohorts in the world. It includes all individuals (~ 1.7 million) tested for HCV, or HIV in British Columbia, or reported to public health as a confirmed case of HCV, HBV, HIV/AIDS, since 1990. It is linked with demographics, medical visits, hospitalizations, prescription drugs, cancers and deaths to create a longitudinal medical history. The overall purpose of the BC-HTC is to monitor disease burden related to hepatitis and associated infections and social conditions, evaluate impact of interventions, and monitor hepatitis program progress to inform policy and programming in British Columbia and Canada. the first study presenting the entire population cascade of care. Some of BC-HTC’s work has been showcased at the American Association of Study Liver Diseases’ The Liver Meeting’s Hepatitis Debrief, which summarises ground breaking research at the conference. Details on the BC-HTC cohort, including publications and presentations, are available at: http://bchtc.med.ubc.ca/. To see what other Canadian researchers are doing, see CIHR's profile on Canadian researchers working together to eliminate hepatitis C.
Canadian hepatitis C experts have suggested the Canadian Taskforce HCV screening recommendations are out of date and recommend updating (Hepatitis C testing in Canada: Don't leave baby boomers behind, CMAJ May 4 2017). The Canadian Task Force on Preventive Health Care published its recommendations on hepatitis C screening for adults today (CMAJ 2017 April 24). *Note: New price negotiations by the pan-Canadian Pharmaceutical Alliance has initiated changes to fibrosis eligibility requirements (item 3 above). For example, starting in 2018-2019, all people with HCV will be eligible for drug coverage (see news article below). The pan-Canadian Pharmaceutical Alliance (pCPA) has negotiated price adjustments that will result in expanded drug coverage to those affected by hepatitis C.
For British Columbia this means that starting March 21 2017, physicians can apply for new drugs. Then, starting 2018-2019, BC PharmaCare will provide drug coverage for people in BC living with chronic hepatitis C, regardless of the extent of liver damage. Stay tuned for more information of hepatitis C drug coverage across Canada. The European Association for the Study of the Liver updated their hepatitis C treatment recommendations in September. Health Canada has issued a Notice of Compliance to Gilead Sciences Canada, Inc. (Gilead Canada) for EPCLUSA (sofosbuvir 400 mg/velpatasvir 100 mg). EPCLUSA is a once-daily, pan-genotypic single tablet 12 week regimen for the treatment of adults with genotype 1-6 chronic hepatitis C virus (HCV) infection for use in patients without cirrhosis or with compensated cirrhosis, and in combination with ribavirin for patients with decompensated cirrhosis. It is the first single tablet regimen without the need for ribavirin approved for the treatment of patients with HCV genotype 2 and 3. The standing working group convened by The Canadian Institute of Health Research HIV Trials Network to review recently published HCV antiviral data has updated Canadian HIV-HCV Coinfection Guidelines. Recommendations include that all coinfected individuals should be assessed for interferon-free, Direct Acting Antiviral HCV therapy. AASLD updated the HCV Guidance: Recommendations for Testing, Managing, and Treating Hepatitis C. The update reflects several important developments, including the recent approval of sofosbuvir/velpatasvir, together with new information regarding the use of testing for HCV resistance associated variants. Jun-29: First all-oral pan-genotypic treatment for hepatitis C approved in U.S.
All-oral pan-genotypic treatment for hepatitis C approved in U.S. The World Health Organization (WHO) released "Guidelines for the screening, care and treatment of persons with chronic hepatitis C infection" (April 2016). The new guidelines include recommendations about screening, prevention, care and treatment. It also presents global prevalence estimates, the natural history of hepatitis C and summaries of treatment studies. For the PDF report see WHO: Guidelines for the screening, care and treatment of persons with chronic hepatitis C infection. For more details see Health Canada’s Summary Safety Review for simeprevir. Health Canada recently approved Zepatier (elbasvir + grazoprevir). This all-oral, interferon-free treatment is for people over the age of 18 years living with hepatitis C genotype 1, 3, or 4 and has overall cure rates of 92-97%. Very common side-effects (occurring in more than 10% of those treated) include headache and feeling tired. See patient information page for a detailed list of common side-effects (occurring in 1 to 10% of those treated). Click here for manufacturer’s patient information page. Click here for more manufacturer’s product monograph. Results from the Phase 3 Ally-3+ trial results were presented at AASLD in mid-November. For patients with cirrhosis who were treated with daclatasvir (Daklinza), sofosbuvir and ribavirin for 16 weeks, SVR rates were 89% (83% for those treated for 12 weeks). SVR rates were 100% for those with F3 fibrosis scores (12 or 16 weeks of treatment). Common side-effects included insomnia (30%), fatigue (26%) and headache (24%)*. Daclatasvir was approved by Health Canada August 13, 2015 for the treatment of hepatitis C.
Gilead announced it has submitted a drug application to the U.S. Food and Drug Administration for a hepatitis C treatment regime for six genotypes of hepatitis C.
Click here for Gilead's news release. Getting treatment can take time as several steps are involved (e.g., knowing one's hepatitis C genotype, having appointments with providers and/or specialists, having an assessment for the extent of liver damage). For table summaries of hepatitis C treatment recommendations by AASLD (September 2017) click here. Daclatasvir combination with Sovaldi got approved by Health Canada today. This now provides a good combination of interferon free treatment for genotype 3. The British Columbia government announced today that HOLKIRA PAK (ombitasvir, paritaprevir, ritonavir and dasabuvir) will be covered by BC Pharmacare. People with hepatitis C genotype 1 can now apply for coverage. Cure rates are reported to be over 90%. The U.S. Food and Drug Administration (FDA) approved TECHNIVIE (ombitasvir, paritaprevir, and ritonavir tablets) in combination with ribavirin (RBV) for the treatment of adults with genotype 4 (GT4) chronic hepatitis C virus (HCV) infection who do not have cirrhosis. TECHNIVIE is the first and only all-oral, interferon-free, direct-acting antiviral treatment approved in the U.S. for adult patients with historically difficult to treat GT4 chronic HCV infection. This treatment for GT4 has reported cure rates of 100% at 12 weeks post-treatment in patients without cirrhosis who took TECHNIVIE with ribavirin (RBV) for 12 weeks. Daklinza, in combination with sofosbuvir, is the first 12-week, all-oral therapy that offers SVR12 for most genotype 3 patients. Hepatitis C genotype 3 is one of the most difficult-to-treat genotypes. This is the first approval of Daklinza in the United States (See Bristol-Myers Squibb Company press release). Reported SVR12 for the Daklinza plus sofosbuvir regimen was 90% for treatment-naïve and 86% for treatment-experienced chronic HCV genotype 3 patients. SVR12 rates were higher (96%) in genotype 3 patients without cirrhosis, regardless of treatment history. In the more difficult-to-treat patients with cirrhosis, SVR12 rates were reduced (63%). These SVR12 rates were achieved with 12 weeks of therapy without the use of ribavirin. In addition to Prince Edward Island and Ontario, Holkira Pak (ombitasvir/paritaprevir/ritonavir tablets and dasabuvir tablets) is now available in Quebec (See Régie de l'assurance maladie du Québec). This interferon-free treatment for hepatitis C genotype 1 has reported cure rates of over 95%. Duration of treatment ranges from 12 to 24 weeks. To compare Holkira Pak with other hepatitis C genotype 1 treatments, see CASL Recommended HCV Treatment Genotype 1. For a summary of Holkira Pak contents and use, see CATIE Holkira Pak Fact Sheet. In addition to Prince Edward Island, Holkira Pak (ombitasvir/paritaprevir/ritonavir tablets and dasabuvir tablets) is now available in Ontario (See Ontario Exceptional Access Program (EAP)). The British Columbia Centre for Disease Control (BCCDC) has announced new HCV viral load testing and genotyping recommendations when treating with Sofosbuvir (Sovaldi) and Ledipasvir-Sofosbuvir (Harvoni). The European Association for the Study of the Liver (EASL) released recommendations on Treatment of Hepatitis C at the International Liver Congress. These recommendations outline optimal management for patients with acute and chronic HCV infections. Getting treatment can take time as several steps are involved (e.g., knowing one's hepatitis C genotype, having appointments with providers and/or specialists, assessment for extent of liver damage). Negotiations with the drug company that manufactures Harvoni were done through the Pan-Canadian Pharmaceutical Alliance (pCPA). **Source Canadian Liver Foundation (CLF), March 25, 2015, Personal Communication. Also see CLF News Release. Mar-25: Harvoni availability across much of Canada! Harvoni is a highly effective and well-tolerated drug with cure rates of over 90% and treatment durations of up to 24 weeks. Negotiations with the drug company that manufactures Harvoni were done through the Pan-Canadian Pharmaceutical Alliance (pCPA). 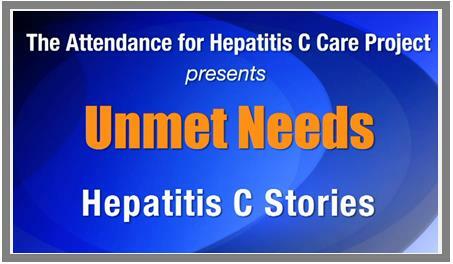 However, the public needs to be aware that getting treatment can take time as several steps are involved (e.g., knowing one's hepatitis C genotype, having appointments with providers and/or specialists, assessment for extent of liver damage). The following provinces are part of the pCPA and discussions, and negotiations are in progress. Decisions are expected soon in most cases. Quebec is not formally part of the pCPA discussions, but negotiations are in progress. *Source Canadian Liver Foundation (CLF), March 25, 2015, Personal Communication. Mar-24: A cure for hepatitis C now in reach for many Canadians! A cure for hepatitis C now in reach for many Canadians! Many provinces and territories now cover (or will soon) Harvoni and Sovaldi for the treatment of people with certain hepatitis C genotypes and treatment histories. PEI will also cover Holkira Pak. These highly effective and well-tolerated* medications are now accessible to many Canadians. *Sovaldi and Holkira Pak may be used in combination with ribavirin or interferon in some cases (e.g., certain genotypes, treatment history). In these cases, side-effects may be more pronounced. Mar 24: Sovaldi and Harvoni now available through BC PharmaCare! Sovaldi and Harvoni now available through BC PharmaCare! As of today, BC PharmaCare will cover two new drugs for the treatment of hepatitis C: Harvoni (genotype 1) and Sovaldi (genotypes 1, 2 3). Feb-06: CASL has released new chronic HCV management recommendations! CASL has released new chronic HCV management recommendations! The Canadian Association for the Study of the Liver (CASL) has released new guidelines for the management of chronic hepatitis C.Recommendations were published in the January/February 2015 volume of the Canadian Journal of Gastroenterology and Hepatology. Health Canada recently approved Harvoni (ledipasvir + sofosbuvir) and HOLKIRA Pak (ombitasvir/paritaprevir/ritonavi/dasabuvir). Both are all-oral, short-course, interferon-free treatments for people over the age of 18 with the genotype 1 hepatitis C virus, including those with cirrhosis. Cure rates for both treatments are more than 90%. Click here for more information on HOLKIRA PAK. BC Pharmacare approves SIMEPREVIR for the treatment of hepatitis C. For more details visit BC PharmaCare Formulary and type "Simeprevir" in the "Generic/brandname" box. Health Canada Issues Notice of Compliance for Harvoni™ (Ledispasvir/Sofosbuvir) for the Treatment of genotype 1 chronic hepatitis C.
European Medicines Agency (EMA) approves Sovaldi for the treatment of chronic hepatitis C.
This 31-minute documentary style video includes patient and provider views on hepatitis C care and treatment (interferon era).